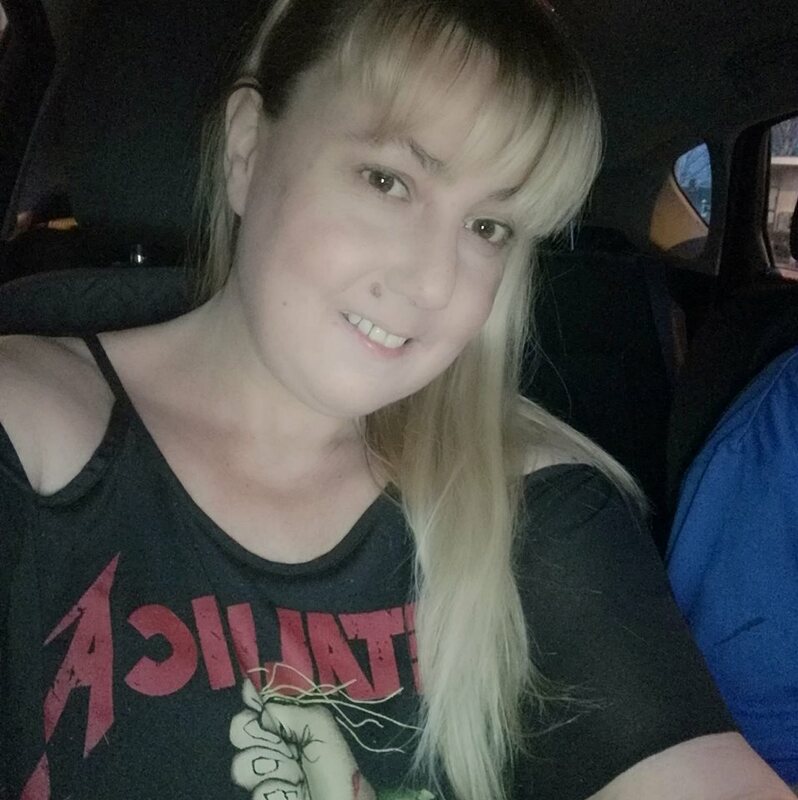 AFTER four years of violent abuse at the hands of her ex, Debbie Ann Jones took the brave step to press charges after the most recent vicious attack, which led to him being deported to the UK last week. Now she wants to use her experience to inspire other victims to take action before it’s too late and things escalate to a potentially fatal conclusion. 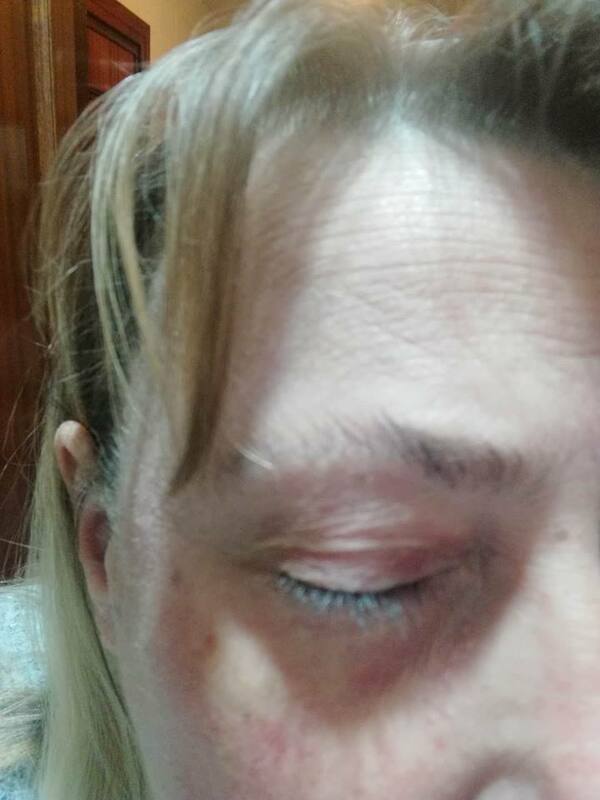 The 40 year-old singer had only been in Benidorm for two weeks after moving to Spain for a new start,when her 45-year-old partner – who cannot be named for legal reasons – beat her before attacking her 54 year-old brother Michael Edwards, who is registered disabled. Speaking exclusively to Euro Weekly News, Debbie took the courageous decision to share her horrific experiences to help raise awareness. Debbie had recently divorced when she got together with her unemployed partner, and at first everything seemed rosy. But things soon changed. “It started off with him chucking a cup at the wall and escalated from there. I really wish I had seen that as a sign, but he apologised and that was that. But three months later, the violence stepped up to a terrifying level. Debbie was singing at a holiday park and her partner was sat right next to her, using his laptop. She asked him to move while she was performing. “When we got back to the house, he shouted ‘who do you think you are, telling me what to do?’ He smashed the mantelpiece above the fire, then literally punched me in the face and dragged me around while I was on the floor. 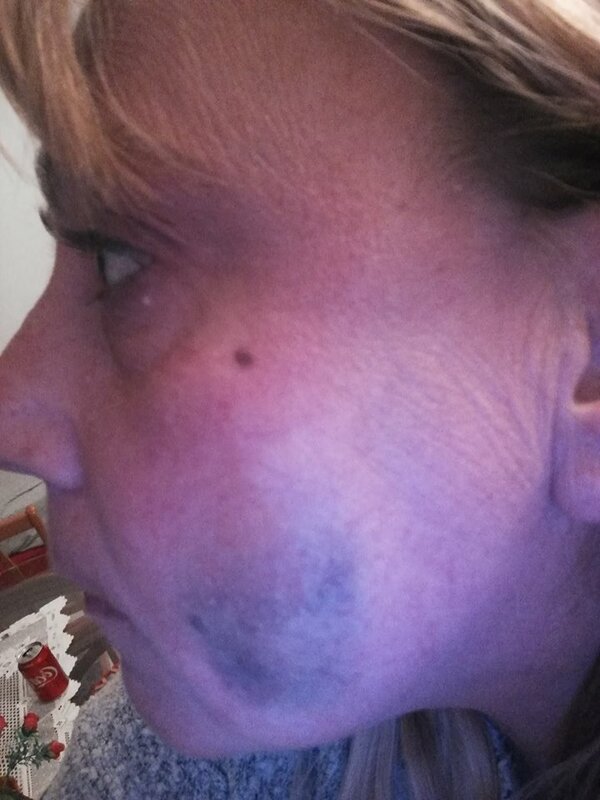 “It was a violent attack. My daughter, who was 18 at the time, came downstairs and that’s when he stopped and ran out of the house. I don’t know why I didn’t ring the police. I tried to see the goodness in him, and I loved him. He kept saying sorry and that it wouldn’t happen again, just like before. I didn’t want anybody to know. “I never knew when he was going to get violent, it wasn’t drink-related and could be every couple of months, or nothing for three months. “It wasn’t drink related. He was very controlling and jealous and by my side 24 hours. I was often scared to use my mobile phone. “But in public he was the perfect partner, he was like Jekyll and Hyde. I tried to be the perfect partner for his sake. Debbie and her brother sold their flat in Wales and they all moved to Benidorm on November 1 this year for a new start. But just two weeks later on November 15, Debbie asked her partner to come home at 9pm so they could watch the last night of fiestas’ fireworks display from the balcony. When he hadn’t come home, Debbie and her brother decided to go to Planet Benidorm. “He found us and was shouting ‘where have you been?’. He was asked to leave because he was causing a disturbance. I walked home with my brother and when he came home minutes later I just knew something was going to happen. Her brother Michael lay over Debbie to protect her. Debbie called an ambulance and because it was an attack the police arrived, too. The attacker was kept in custody until a court appearance the following morning. “The officers asked me if I wanted to press charges and I said yes. I knew it would be murder next. We gave statements and were in court by 11.30am. The police and justice system were brilliant, really on the ball. The aggressor was given a suspended sentence of two years and nine months, cannot contact Debbie for nine months nor Michael for three years. He was also deported to the UK. “I feel relieved but just keep questioning why I put myself, my brother and my daughter through it all. They wanted me to leave him. I’m going through the aftermath and putting myself on trial. “I don’t want this to happen to anyone, man or woman. Anybody is going through abuse should run, get out of the situation and call the police immediately after an attack. I can’t stress enough that it’s important to trust and believe in yourself and the system, because it works. In Spain victims of domestic/gender violence can call 016 for multilingual help and advice 24 hours a day. 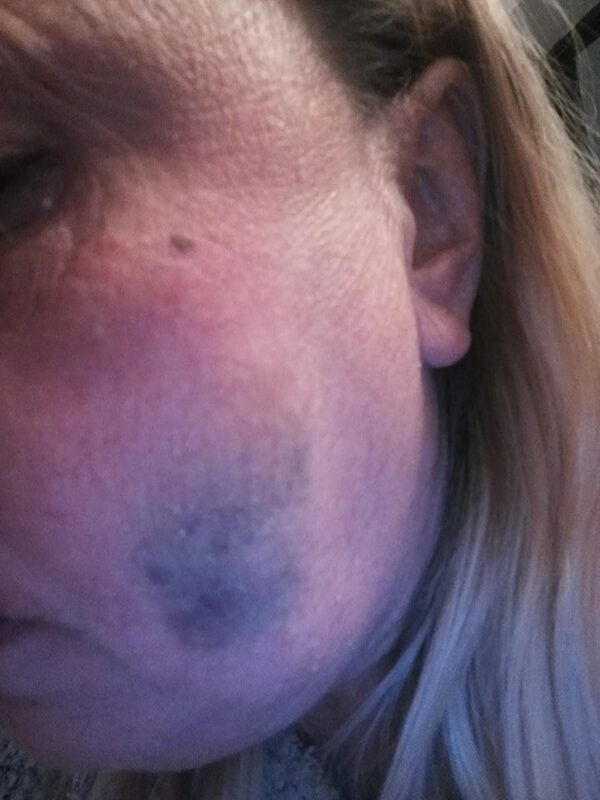 BLACK EYE: The attacker punched Debbie in the face twice. 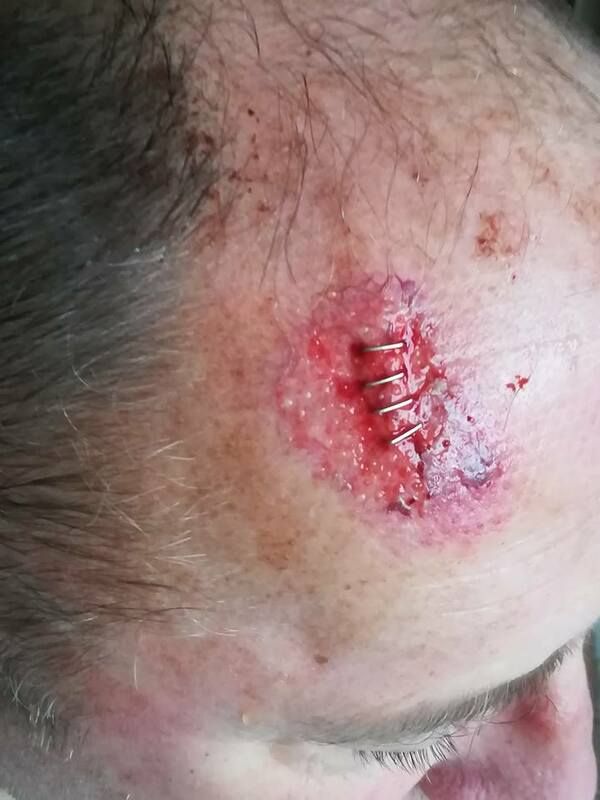 VICIOUS ATTACK: Brother Michael Edwards was hit with a table leg. As a retired Police Officer I have dealt with countless incidents where the woman has, after being assaulted by her partner, refused to press charges. Every time I knew that we would be called back to the premises again and again for the same reason. Women need to read this report and realise that a violent partner will never change he will always resort to violence. The same goes for a violent female partner.